How to correctly handle an Esox, to make their stay in your boat, or from the bank, as best as possible. In the end we all practise catch & release, so they can be caught by someone else in the future as well. Pike, and Muskie in particual, have teeth. Loads of them, and razor sharp. The last thing you want to do is stick your hand in their mouth, or any body parts. Pain guarenteed. When handling fish, there is another danger that comes lurking around the corner: hooks! On any lure we fish with, are hooks. Otherwise we wouldn’t be able to catch fish. Hooks attached to lures are often razor sharp, and carry barbs. So once you’ve hooked a fish, the hook will stay in. I have encountered hooks into my fingers for several times, but all those times I was able to pull them out, because they didn’t went deep, something I hope I’ll never encounter. As I spend alot of my days alone on the water, I decided to purchase some gloves, to protect me from hooks, and the fish it’s mouth. In my local tackle store I walked into Sea Grip gloves. Now I must say they are very handy, and I use them alot. The material on the inside of your hand palm is made out of a strong kevlar material, and hooks cannot penetrate inside. There was a simple method to test this, I put one on, and my dad tried to pull a hook in it. It didn’t pull through. When going on the water, I always carry them with me. Both left and right hand side. The only downside about these gloves are that they are pretty big. By big I mean, they come in one size, and because my hands are not really big, I have some room left. Wich is rather annoying when landing a fish, because you can’t really feel what is going on. And second to that, on top of these gloves, there is no protection at all. Just the fabric material it was produced from, wich is not hook proof as I experienced one day fishing with spinners. Lucky for me, the hook went into the glove onto my index finger, on wich I carry a ring. So the damage was not that big. What else do we need? Well, a good set of pliers! a pair of longnose pliers, sharp scissors, measuring tape or bump board, bold cutters, first aid kit, and that’s basically it. Carry two types of pliers. One longnose, and a shorter version. The long one comes in hand when the hooks are deep, the short one when strength is needed to pull out the hook. Wire cutters to cut the hooks, first aid kit, when something bad happends, or you get injured. And last but not least a measuring tape, to measure the caught fish, or lay it on a bump board. 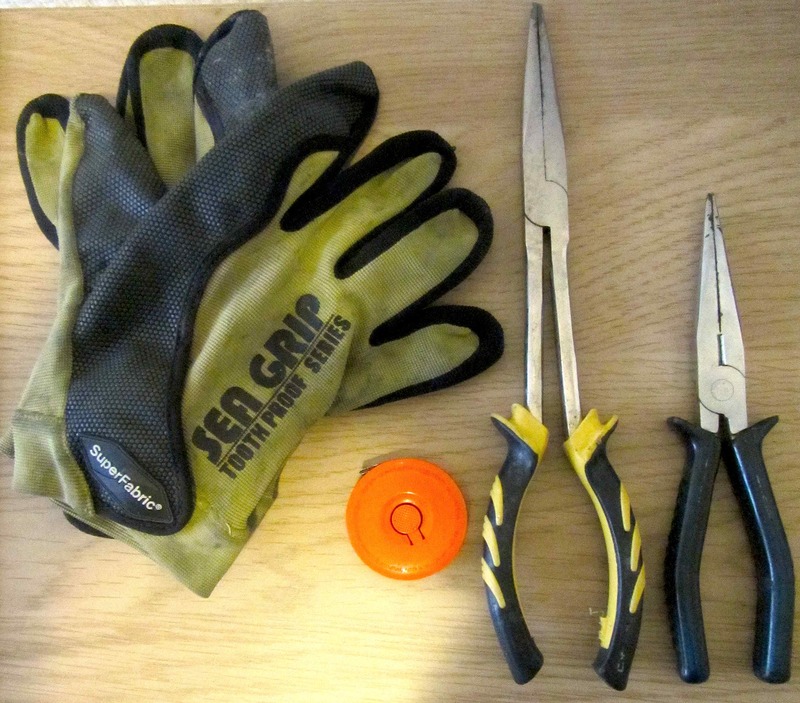 And one thing that’s essential to have in the boat, or from the bank, and unhooking mat! The one that I use is made for Carp fishing, and wide and big enough to give any fish a comfortable stay. Big or small, take care of them all! Let’s picture a scenario. You’ve hooked a fish, if it’s a small one it can be hand landed. If it’s a big one you can hand land it too. I rather choose not to, cause most big fish go absolutely beserk when trying to hand land them to the boat. People often claimed that hand landing any fish to the boat, or from the bank was better for the fish. Nets would be harmfull or would only damage them. This was written in all magazines and books and soon became normal. And although it might look great on any video or photo, I sincerely believe it is harmfull for the fish. Small fish up to maximum of 35 inches, are handlanded. Wich means, grabbed by the neck, and than unhooked by holding it behind the gills. Bigger fish are landed with a net. Preferable unhooked in the net, camera prepared and taken out of the net for a few pictures, and back into the net, to strengthen up and than released. That’s the way to do it! When posing with a fish to the camera, ALWAYS make sure to give them some support. Imagine yourself hanging with your full body weight onto your lower jaw waiting for the picture to be taken. Not the way Esox or any type of fish in particular should be handled! The picture below gives a great example of a correct way. The fish will thank you for it! How to handle any Pike or Muskie!